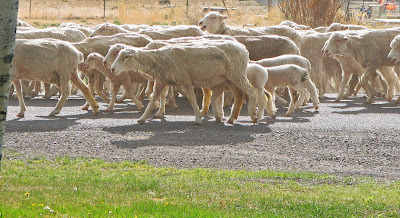 our kind of traffic jam...coincidently...your dog will chase after these sheep when they cross your front lawn, and when that happens sheep move REALLY fast and go jumping and flying everywhere...which then coincidently makes for a REALLY mad farmer who is transporting his sheep from the winter location to the summer location...sorry dude next time i'll try to keep the dog contained. we had a great weekend. it was spent outdoors, outdoors, and outdoors. we played with friends and we weeded, cleaned up the backyard, and really just soaked up the sun... i did nothing remotely crafty other than work in the garden and sit and enjoy the kids enjoying the sun and getting pink cheeks from playing hard...it makes for a happy weekend. just one more week of school left for us, i can't wait! that means summer library reading days, all day outside play, shorts and tank tops, and the awaited california trip! Love the pictures. 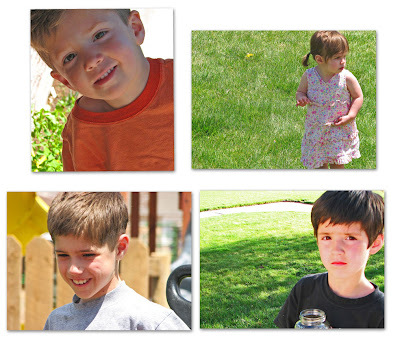 Your kids are SOOO darn cute. Ok, first when did Ryan grow up? His face has changed so much. 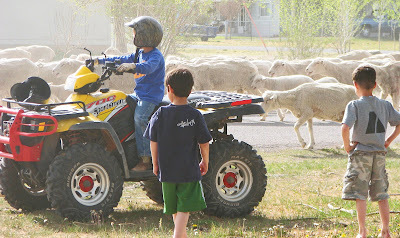 Second, I thnk next time a farmer decides to migrate his sheep across your lawn you should send all the the kids and the dog to chase his sheep, then maybe he won't give you any lip. Third, you should take a picture of your goats and send it to Jacob then he will have a great conversation starter with the locals. Fianlly, when you wear your summer tank/halter tops hopefully the other ladies in town won't get jealous, I know I envy your shaply biceps. burg you crack me up! I'M not the one wearing the tank/halter tops! katie is! i mean come on! i have to be chaste but she can be a floozy till she gets to be that age! i guess i should of explained that a little better...but you know me and sarcasm. Oh! My! Gosh! Crazy small town livin'. You are too funny and I love the pix of the kids! This is funny! When are you coming to CA...and what part? i'm going to san diego, los angeles and san luis obispo...to see family and friends from college! tables, armiores, and chairs oh my! 12:08 a.m. to 7:06 a.m.